I've been to Dubai before but only ever as a stopover where I've always been furiously running to the next flight. We arrived in Dubai early in the morning and it was lovely to be able to get a taxi to our hotel with the sun shining so we could really see the city. I've been told so many times that Dubai looks a bit like the fictional Gotham city, and it really does. Tall buildings with sparkling glass tower over you and I couldn't help but be impressed by the Burj Khalifa. We stayed at the Movenpick IBN Battuta Gate. The staff there were so incredibly helpful and the bed was super comfy so I couldn't couldn't fault it. We were only in Dubai for a few days visiting some friends but we really tried to pack in as much as we could. 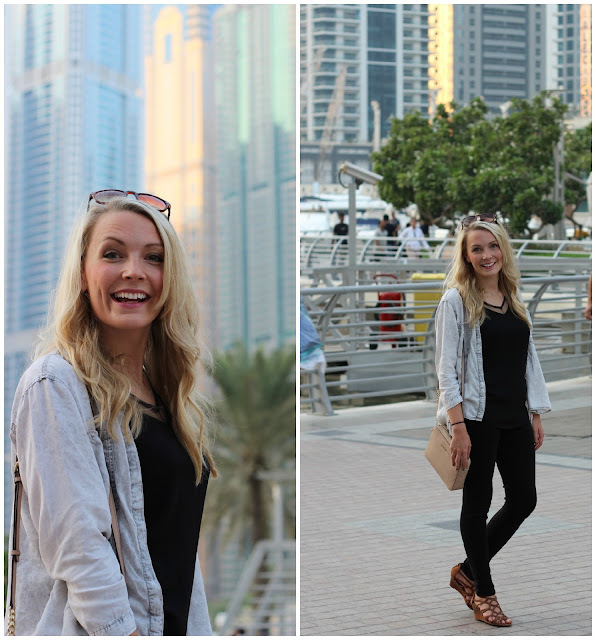 My favourite evening was spent strolling along the marina walk followed by a short and inexpensive trip on the Dubai Ferry. It was fantastic to float across the marina and take in all the twinkling lights, and look in awe at some of the incredible yachts. We got off the boat at the stop next to Pier 7 and went for an awesome meal at Asia Asia. The restaurant had views of the marina, and a bit of a clubby feel, which made us feel a bit like we were back at uni - in a good way! My favourite dish was the avocado and prawn sushi, which was incredible, although my husband did steal a few pieces. I'll forgive him though, it was delicious. We also headed to the Palm, and the Atlantis resort where we made the most of the Aquarium. We even found Nemo. We also did some less touristy activities and spent some time in some of the HUGE malls as well as venturing to The Cheesecake Factory, as we don't have one in London, and I knew my husband would be astounded by the size of the portions. Dubai has so much more to offer than I could have imagined, and we left having only scraped the surface of this awesome city. lovely post, would love to visit Dubai! Thank you so much, it was a lovely trip. The photography on your blog is awesome.